Donation attendant Derek Lopes loads up a container with a variety of household goods at Goodwill while Goodwill store manager Ken Leung observes and assists. The items came from a Big Brothers Big Sisters truck, driven by John Tuisamata. Goodwill Industries of Hawaii and Big Brothers Big Sisters of Honolulu are working together to raise money. In January, Goodwill started buying at wholesale price the donations Big Brothers Big Sisters collected from the community. This doubled the amount of clothing and small housewares it sells in its stores. The revenue from the Goodwill stores provides job training and employment for the disabled and others in need. The revenue from the donations allows Big Brothers Big Sisters to provide adult companions to children in need of a mentor or friend. Big Brothers Big Sisters had been selling the donations to Savers Inc., a "for-profit" organization, which sold the items in its three thrift stores, according to Big Brothers Big Sisters Director Dennis Brown. But because the company accepted only about 80 percent of the donations, Big Brothers Big Sisters had to buy space to keep the excess -- an additional cost, he said. On the other hand, Goodwill can use all the merchandise, so "it's a real nice fit," he said. Brown said: "We're helping each other achieve our missions with more revenue and similar growth paths. We are using opportunities to cross-promote each other and help each other. The relationship at all levels is outstanding." Since January the retail space has increased 30 percent at Goodwill's main property on Beretania Street to display the merchandise, said Laura Kay Rand, Goodwill's public relations spokeswoman. The customers love it because there is more of a selection, and revenues have increased as a result, she said. Mary Beth Van Hoogstraten, of Kaimuki, a weekly shopper at Goodwill for 20 years, said she liked the expansion of the women's clothing section, which makes up 70 percent of the apparel department. The Beretania store is her favorite because "the racks are orderly, it's clean, air-conditioned and the staff is nice. And they throw out the junk so you're not wasting time looking through clothes with holes or stains." The weekly sales, up to 75 percent off some items, guarantee that the stock is frequently rotated so the clothes are "fresh," she said. She is such a dedicated customer, she said, that "sometimes I buy my own stuff back. It's crazy!" Her son pointed at one item she recently purchased and asked, "Hey, Mom, didn't you just put that stuff out last week?" Behind the retail store is Goodwill's 44,000-square-foot property containing training classrooms, administrative offices and the production area. This area is where all the donations are dropped off, sorted, cleaned, marked with tags and hung on hangers. The stuff that is broken, soiled or does not sell is compressed into bales and shipped off to a "salvage market," "so we get the most out of every single donation" and "keep it out of a landfill," Rand said. 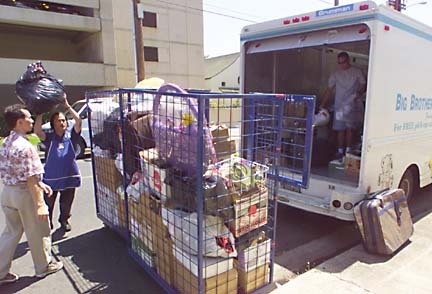 Last year, Goodwill served 4,467 people through these programs and placed 1,212 people into jobs in Hawaii. Its goal is to serve 7,500 per year in Hawaii in three years, she said. Big Brothers Big Sisters also wants to increase its revenues to serve 700 kids, ages 6 to 16, by 2004, according to Brown. Last year, the organization served 584 people.